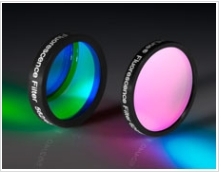 August 23, 2011, Barrington, NJ USA — Edmund Optics® (EO), the premier provider of optical components and tools, introduces new Multiband Filters. These versatile multiband filters are ideal for real time live cell analysis and high speed imagery. Each Multiband Filter is hard coated and then mounted in a 25 mm diameter black anodized housing for durability and ease of handling. Featuring multiple pass bands on a single filter greatly enhances fluorescence imagery and allows for easy setup for a wide range of fluorescence applications. Every Multiband Filter provides high average transmission and excellent blocking. This yields the maximum brightness and contrast in any of an extensive range of applications. Multiband Filters are perfectly suited for simultaneous viewing of multiple fluorophores. Edmund Optics’ Multiband Filters are available in eight different Dual Band models with pass band wavelengths from 387 & 480 nm to 577 & 690 nm. Five models of Tri-band Filters are offered with pass band wavelengths from 387.5, 478 & 555.5 nm to 465, 537 & 623 nm. Four Quad-Band Filters are available with pass band wavelengths from 387, 485, 559.5 & 649.5 nm to 446, 523.5, 600 & 667 nm. Multiband Filters are in-stock and available for immediate delivery for fast turnaround and excellent value.